When you want to keep doing what you love, sometimes it’s best to just go directly to the people who love what you do. And that’s precisely what one passionate soda manufacturer is doing: Coca-Cola has started a Patreon page to crowdfund its love of making carbonated beverages. Awesome! It’s great that the internet is willing to chip in and help The Coca-Cola Company fund its creative dream of continuing to make Coca-Cola. On its Patreon, Coca-Cola explains that producing 800 million bottles and cans of soda per day can get expensive, with lots of hidden costs like buying thousands of tons of aluminum from wholesalers and shipping the final product to millions of stores in more than 200 countries. 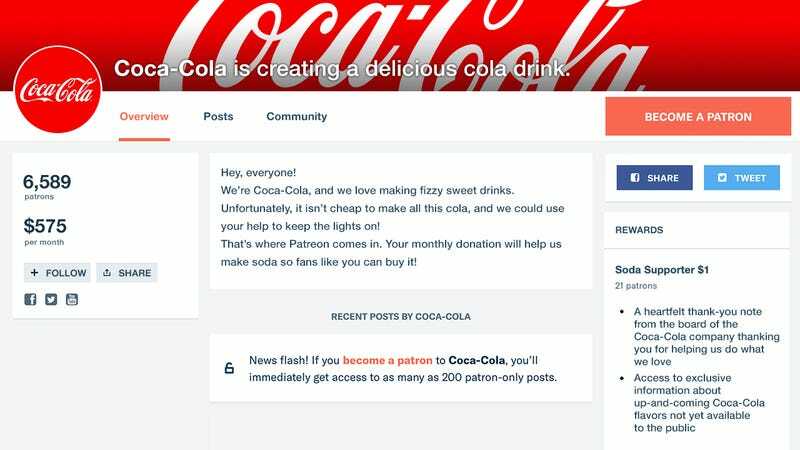 According to the soda corporation, it’s hoping that the generosity of Patreon backers will ensure it always has the resources it needs to stop worrying about money, focus on its craft, and keep delivering Coca-Cola to grocery stores and restaurants so people can buy it. Aside from helping the 60,000 Coca-Cola employees continue their passion, your monthly donation to Coca-Cola will also earn you some pretty cool, exclusive backer rewards. At the minimum tier of $1, you’ll receive a monthly thank-you email from Coca-Cola. At $20 a month, you’ll receive a physical postcard with a picture of a can of Coca-Cola on it, to show you what you’re helping make. And at the high-tier level of $100 a month, you’ll receive an actual 20-ounce plastic bottle full of Coca-Cola, letting you directly experience the end result of your charitable contribution. Coca-Cola can rest assured knowing that it’s got plenty of grateful fans willing to give back to a company that’s sold them so much soda over the years. It’s another crowdfunding win thanks to Patreon! How Many Of These Failed Kickstarter Projects Have You Backed?